Diamond Dry hole saws (0903). For drilling holes in granite, ceramic and porcelain tiles and marble. These Diamond Dry hole saws can to be used with a cordless drillingmachine (>1500RPM). Smaller sizes (up to 16 mm) have a 8 mm hex and internal wax coolant. Larger sizes come with an integrated Click&Drill® adapter, for which a centre drill, for accurate positioning, is needed. 18, 20, 22, 25, 27 en 30 mm. 32, 35, 38, 41, 45, 51, 54, 55, 57, 65, 68, 73, 76, 83, 110 en 120 mm. Diamond Dry hole saws sets (0903). For drilling holes in granite, ceramic and porcelain tiles, and marble. Lager sizes come with an integrated Click&Drill® adapter, for which a centre drill, for accurate positioning, is included. Centre drills for Diamond Dry hole saws (0903). 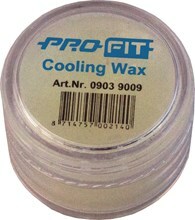 Coolant wax for Diamond Dry hole saws (0903). Recommended lubrication and cooling for a longet tool life.